Romania: Brâncuși egg under construction! Some thought this wouldn’t happen and yes, we were among them. But apparently it’s real, because demolition of the old stadium began last week in Craiova, Romania. New 31,000-seater will replace it. Last week, exactly on May 11, demolition crews began their work at Stadionul Ion Oblemenco The extremely dated stadium in Craiova will give way within the next two months. City hall will pay for the operation, which was tendered at €320,000 ($360,000). The stadium recently was in dire state, as indicated by the photo (left). After ground is cleared, it can be broken for the new stadium holding 31,000 people. No time should be wasted, because it’s the very same consortium of companies on the job – no-one else submitted their bid. 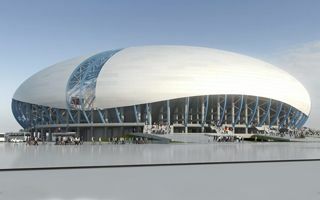 The joint-venture is led by SC Con-A, a company from Sibiu, who have previously delivered the Cluj Arena. Design work during the contract will be carried out by Dico și Ţigănaş, who have also worked on Cluj Arena before. Our Readers should know the company well, because its founder Șerban Țigănaș was one of the Jurors in the annual Stadium of the Year competition. The new stadium, estimated to cost some €55 million ($62m), is expected to follow the vision of Proiect Bucuresti, who designed its outer shape based on works from famous sculptor Constantin Brâncuși. Judging by the renderings and description it should represent very decent value for money. However, local athletes may not like it as much as the football community. The stadium will be football-specific, while current one has a running track. Mayor Olguţa Vasilescu, for whom the stadium is a publicity success, released a controversial statement: “Athletes who have still trained at the stadium are asked to find a new place for themselves. We’re demolishing it, good luck!”.